Once upon a time there was a nurse who never felt like her comfortable life in a land known as Ohio was what the Lord had planned for her. So she moved to Haiti and not a lot has been comfortable since but the nurse experienced more adventures than she ever did working at Level One Trauma Hospitals in the states. Last week was one of these adventures. She took public transportation (which is always an adventure in Haiti) to a land full of sun and beaches called Jacmel. There is a little girl who lives about a 30 minute motorcycle ride up in the jungle outside the city. Most people would have went in the daylight, but this nurse likes to shake things up, so her and her prince took a motorcycle ride into the darkness. This land does not have electricity so it was really dark! The prince asked the nurse if she had a lot of money in her purse. The nurse, confused, said no. The prince said that was good just in case they got robbed. They crossed 3 rivers, one being too deep to cross by moto, so the prince carried the nurse across the dark river on his back. They finally arrived at Makensia's house. Here's her story: When Makensia was just days old, she was sleeping on a bed next to a nightstand that had a candle on it. The sheet covering her caught fire and her R foot was severely burned. Her toes were burned off and her foot very deformed. After seeing where she lives-literally the middle of nowhere-it is amazing she didn't die of an infection. When the USNS Comfort ship was coming we called Makensia's family to have them bring her to Port au Prince in hopes of her getting surgery. She was chosen out of the HUNDREDS that showed up! Her foot was bent backwards up her shin by the contractures the burns left. She could not walk but hobbled around. A Plastic surgeon on the ship released the contracture and now her foot is flat and moves and she can walk on it with little difficulty! The nurse and Makensia had a good visit. Makensia demonstrated her "runway walk" and everyone cheered. The nurse checked out her wound and took out her stitches by the glow of a cell phone for light b/c this entire village lives without electricity and the nurse likes the challenge. Makensia's story is not over. She still needs a few more surgeries to fix her all up. The nurse promised Makensia she was going to look for more doctors and possibilities to help her. One of those ways of looking is to post a blog about her and see if any doctors coming to Haiti would be willing to help her. They said their goodbyes and the nurse rode the moto back out into the darkness with her prince following behind with a camera. (and no mom...we didn't get robbed). 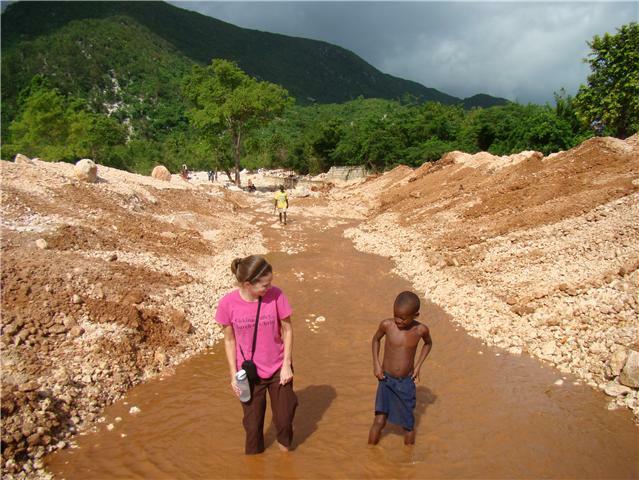 The nurse who loves the adventures the Lord gives her would like to say thanks to everyone who supports her in her work in Haiti. This far away land really isn't far away distance-wise but way far away technology wise. She would also like to thank to Lord for not letting her fall off a motorcycle in Haiti yet. She welcomes donations into the vehicle fund her home church back home has opened for her. please put "Ginny Andrews" in memo of check. Ginny, I feel like I am back in Haiti when I hear your stories..... you make me very homesick ! Tell your prince to keep you safe . Hope to see you in March !